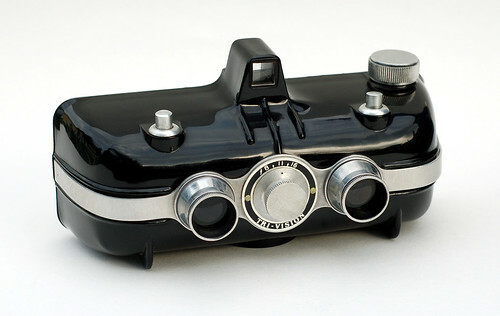 The Haneel Tri-Vision was a Bakelite stereo camera for making 28×28mm double exposures on 828 roll film. It was made by the Haneel Company in Los Angeles, CA, between 1946-1949. The first version had a Bakelite back, the later metal back was an improvement. The camera has a characteristic rounded shape. Together with the aperture adjustment knob between the two Lestra-Lite 1:4.5/60mm lenses and the two shutter release buttons, one for 1/50 sec and the other for B mode, the camera has a very individual design. 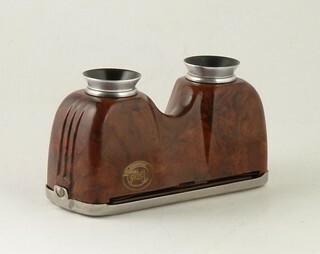 The company also delivered a nice Bakelite stereo image viewer. A stereo camera with the same body style was the Kirk Stereo. This page was last edited on 25 November 2017, at 04:33.